Mark Magoon is a poet and writer. Among his publishing credentials are works of poetry, creative nonfiction, review, and interview. His work has been nominated for Best of the Net and the Pushcart Prize. His first book of poems, The Upper Peninsula Misses You (ELJ Editions, 2015), is concerned with circumstances both self-created and beyond control, and the strain between people and their time and place. Magoon is currently working on a poetry chapbook and a collection of short stories, and he contributes to Chicago Review of Books. 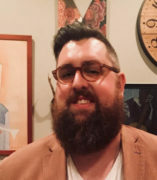 He teaches social justice themed first-year writing courses and is a UIC Summer College Instructor with the Summer Enrichment Writing Workshop.